It is that time of week again! 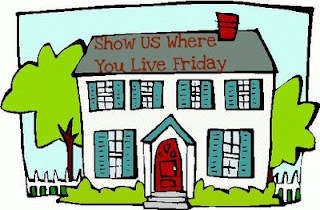 I have come to look forward to Show Us Where You Live over at Kelly's Korner every Friday! I will have to steal the laptop away from hubby at the hotel this weekend so I can see every body's rooms! Kids rooms to me are the best rooms of all. You can have soo much fun with them. The cars are decals I found on Ebay by some artist. The airplanes are Wallies from PBK. I loved how it turned out so much that I had bought duplicates of the Wallies and cars so I could replicate it. I decided since I did not do it here for the boys I will paint it again in their play room at the new house. Here is the boys room in our current home. It technically is Oldest's room but Littliest sleeps in here as well. He has since he was 19 mths old. On a trip back to Ga for Thanksgiving I let the boys sleep together at the GPs house and well that did it. As soon as we came home there was NO going back in the crib. Littliest had to sleep with big brother. They even share the bottom bunk because I will not allow either of them on the top. The bed wiggles too much so at the new house the beds will stay separated. Different view of the room. The dresser I actually finished for hubby back when we first moved into our very first home that we built. It was the first real piece of bedroom furniture we ever had. Even though I love it it may be getting painted at the new house. Here is the nursery in our current home. Even though Littliest only spent 4 months sleeping in here he still calls it his room. We asked numerous times if he wanted a big boy bed in there and he said no he likes sleeping with brother. Easy enough for us. Made staging really easy though I need to get the quilt back up on the wall. This is the nursery at our old house. I love the blue walls. To me it makes the bedding pop more especially the curtains. I purchased this set for Littliest first birthday because I wanted him to have something of his own and I was tired of sail boats. The valance is store bought and the panels were made by me and Nana. The polka dots I just traced on some heat bond and iron on to the fab and then cut out and ironed on to the panels. No sewing involved. I admit started to sew um for effect but gave up after two because it took tooo much time. So there you have it. My boys rooms! I can not wait to see what their new room will look like. We have already started planing for it. Oldest voted for a dinosaur bedroom so for his 5th bday every body purchased pieces of Company Kids dinosaur bedding. I even found a patch work comforter at Target that matches perfectly so Littliest will get that with a dino sham and Oldest will get the Dino comforter with the sham that matches the patchwork quilt from Target ( I would link but can not find it on the website). I just can't wait! I even promised to attempt a volcano on the wall with a flying Pterodactyl hanging from the ceiling. I think I have talked Oldest into just some dinosaur decals I found on Etsy. The Pterodactyl I think I can do. Not to sure abt the volcano. I also think the beds will be going black. Thanx for stopping by ya all! Its been fun! I will be back on Monday for sure but maybe Sunday to share our new house! Cute rooms! Love the painting! cute cute rooms. Love the cheerfulness of your nursery. Yes, we are new to The Woodlands, but so far we like it. Starting to visit churches this Sunday. Hope you guys enjoy Humble. Blessings to your family! So cute. And if they want to share then that leaves a room open for an office or guest room or a man cave in the new house. They can maybe opt for seperate rooms when they are older.